As with the other reviews here, I think these basses are exceptionally good, the trebles, not so much. These trebles have a very 'plastic', artificial sound to them. They do not have the round sound or depth that a high quality nylon string should have and the intonation - although fairly accurate when measured with a Snark tuner, does not ring true to the ear; the spectral balance is off and as a result, they sound out of tune with each other even when the tuner says they are at the proper pitch. So, even though I like the basses a lot, the cost of these strings, just for three good basses, is completely unjustified. If Pyramid would make split sets of these strings, I would definitely buy the basses and find suitably matching trebles somewhere else. These are my favourite bass strings. 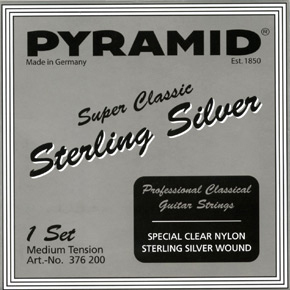 I've tried the other silver strings, which I found to be a bit too bright and grating. These basses have a wonderfully smooth sound. They have a warm, rich sound. Also they are not to stiff in tension. Just right. The last longer than any basses I've had, tune up fast, and hold pitch nicely right away. And they aren't as squeaky as most basses. The trebles are also very nice, but I find the tension is a little higher than 'normal'. So I match a different treble with this set. But it's well worth the money for these basses, and they'll last twice as long as a cheaper set. I gave these strings five stars because I have done a pretty exhaustive search for the right basses over the years for my Ramirez 1a, and spruce Peter Barton. I've tried the Labella silver strings, and the Hannebach's. Both sounded 'grating' compared to these silky smooth Pyramids. These Pyramid basses sound so full and resonant. You can get good tone variety out of them. The normal tension trebles seem more like normal to high tension. To stiff for me, but they sound great. I use the basses and toss the trebles, but if you don't mind a little higher than normal tension these might be ideal for you.